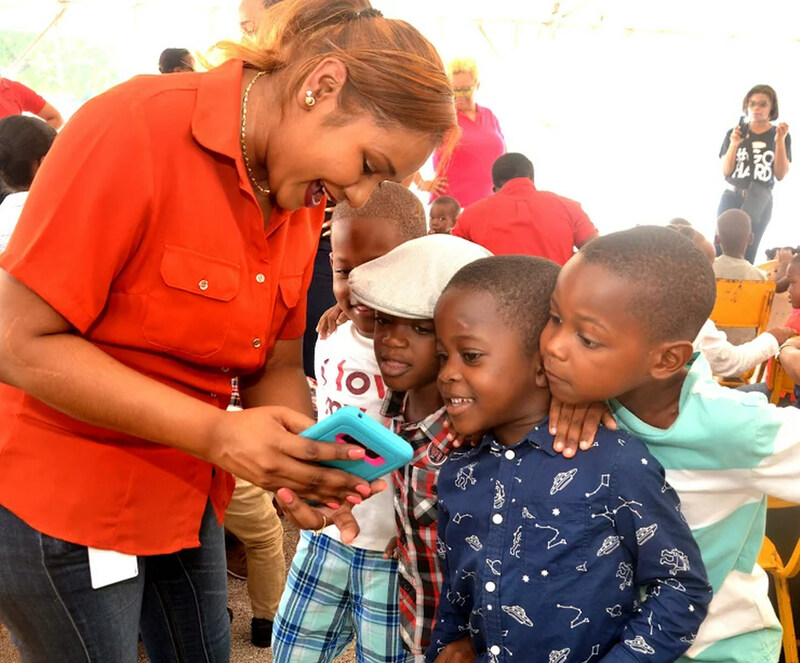 THIS IS SO COOL: Students of the Majesty Gardens Infant School are fascinated with the features of the phone being demonstrated by Kay-Ann Jackson, GraceKennedy’s Human Resources Officer. The students were at a Christmas treat put on by the Grace & Staff Community Development Foundation (GSCDF) at the Breezy Castle Sports Complex in downtown Kingston. 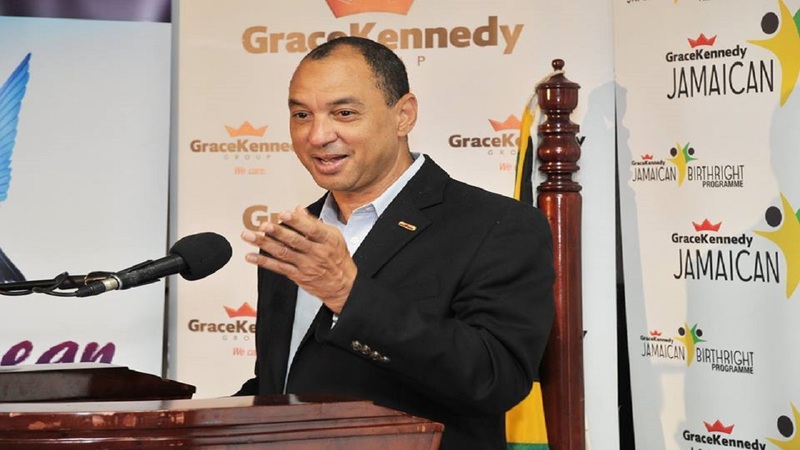 Like the traditional Santa Claus with his elves, Don Wehby, Group Chief Executive Officer of GraceKennedy Limited, led his team and walked through a number of communities in downtown Kingston and rode on Coaster buses to other more distant locations, to spread Christmas cheer. They visited children and the elderly of Craig Town, Majesty Gardens, Central Kingston, Payne Avenue and De-la-Vega City in Spanish Town, to distribute baskets of goodies and sing carols. 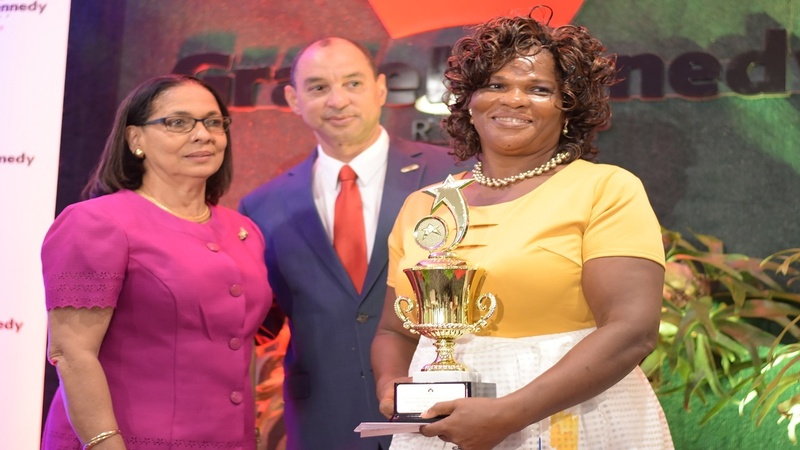 For GraceKennedy, celebrating its 95th anniversary of operation in downtown Kingston, Christmas treats are “the icing on the cake”, as the company has built up a strong tradition in serving both the young and senior members of the community through the Grace and Staff Community Development Foundation (GSCDF). Wehby, in fact, said, “GraceKennedy is not just about showing up once a year to hand out gifts… Yes, we love to do that too, but our relationship goes way beyond that. We are about building a better Jamaica." 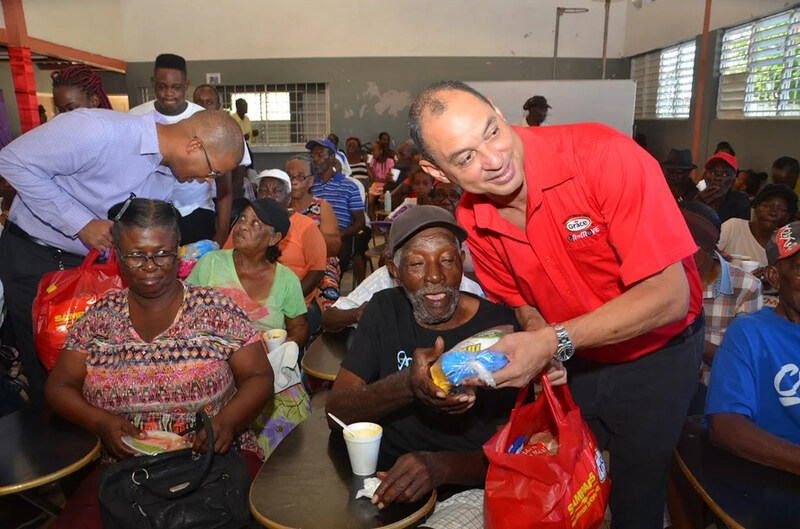 Owen Beckford of the De-la-Vega City community in Spanish Town, accepts a bag of GraceKennedy goodies from Group CEO, Don Wehby, at a Christmas treat for senior citizens, put on by the Grace & Staff Community Development Foundation last week. Addressing seniors of some Spanish Town communities last week at the De-la-Vega City Community Centre in the old capital, Webhy made mention of a young man whom the company assisted in his educational pursuits based on a request from one of the seniors. The young man, Clinton Gordon, subsequently scored 11 subjects (with several ‘A’s) in the secondary school (CSEC) examinations. Results like those, he pointed out, amplified the mutual benefits of a deep relationship between the company and the community around its operations. The GSCDF not only provides financial grants and scholarships, but works closely with families to help young people achieve their potential through its STEM Centre, homework programmes, access to counselling and career guidance, and provision of exposure to music, drama and photography. “We have an ongoing relationship with the communities which makes it even more special when we get together with them for the holidays,” said Tanketa Wilson-Chance, General Manager of the GSCDF. During the December celebrations, three 95-year-old senior were specially recognised with gifts from the CEO. They were: Elfreda Robinson from Central Kingston; and Doris Maud Heron and Doris Madge Sinclair from De-la-Vega City in Spanish Town. 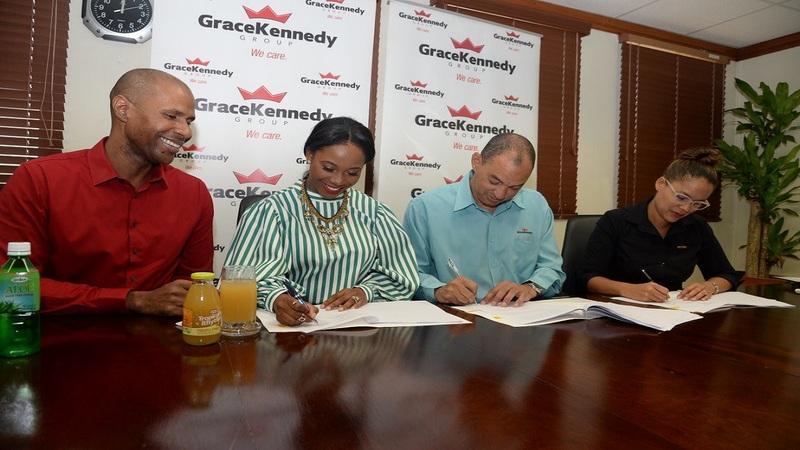 GraceKennedy marked its 95th anniversary in February of this year. Among the other treats were a fun day at the Breezy Castle Sports Complex in downtown Kingston on December 15 for the children and teachers of the Majesty Gardens Infant Learning Centre and Primary School. “Given the nature of the community, with high unemployment and other challenges, it’s good for the kids to have this kind of gathering and the positive exposure that it brings,” she said. The children also received back-to-school packages and the teachers and ancillary staff were presented with gift baskets.